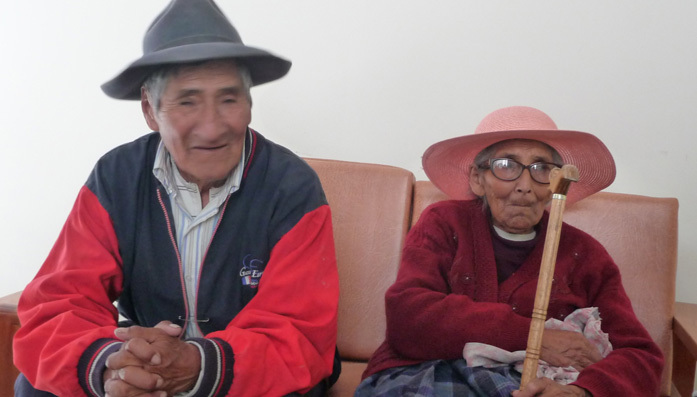 Bernardino and Leonarda are small-holders who live in a remote village in the Andes mountains. Their daughter lives a 5 hour bus journey away and they miss her very much. Their main source of income is from their livestock – Bernadino works hard looking after his ten alpacas. Leonarda is in charge of the house and enjoys cooking and cleaning. Over time Bernardino and Leonarda both found that their eyes were clouding over. They were both developing cataracts. Bernardino and Leonarda found it hard to see, but Leonarda suffered most as both eyes were affected. She couldn’t see to move around the house, clean or cook. She couldn’t even feed herself. Feeling trapped and helpless, Leonarda was in despair. “I was so desperate, I wanted to die”, she explains. Every time he left the house, Bernadino would worry that she would hurt herself. Bernadino only had cataract in one eye, but as his sight got worse it was getting harder for him to get out at all, to feed and look after his alpacas. However, there is hope. A CBM-funded outreach worker visited their community and told Bernadino and Leonarda that their problems were a result of cataracts. They were brought to our partner hospital in Arequipa for surgery, where they each had a 15-minute operation to remove the cataracts from their eyes and restore their sight. They left the same day to recover at their daughter’s house nearby. Leonarda can now see much more clearly; she cooks and cleans again and doesn’t need help eating. Bernadino’s sight is completely restored and he loves reading. Now he can read the bible a lot in his spare time and looks after the livestock once again.